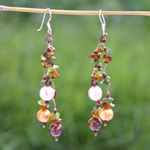 Inspired by the colors of spring, Sirada designs and handcrafts this beautiful pair of earrings. 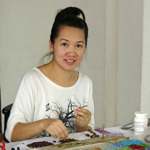 The jewelry artisan threads peridot, quartz, pearls and sparkling glass on golden rayon threads by hand. 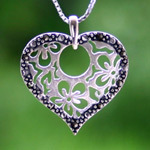 They hang from sterling silver. 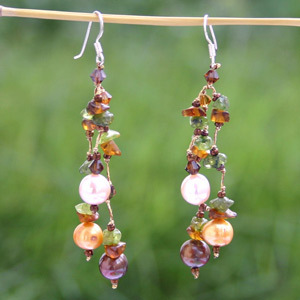 Materials: Peridot, quartz, pearls, sterling silver (.925), glass and rayon.